BRAND NEW HOLIDAYS FROM MARMOT! 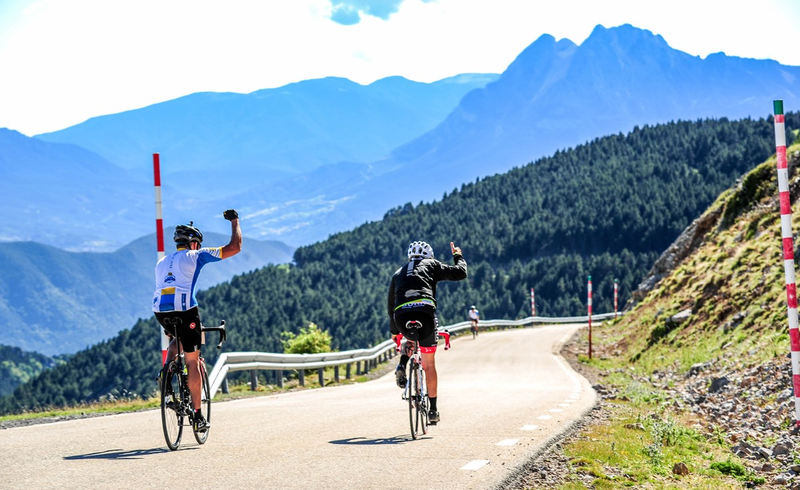 Due to popular demand, we’ve introduced this fantastic road cycling holiday for 2019… Just inland from Nice, the Mediterranean Alps are an idyllic playground for cyclists looking for quiet roads and a variety of both challenging and gentle climbs – it’s no wonder that this region is so popular with the pros. Throw in some spectacular and varied scenery, the Mediterranean climate, some comfortable hotels and the peerless support of the Marmot Tours guides and this has to be the perfect Summer escape. You can read more about this area in a couple of Cyclist articles in which we featured (November 2017 & July 2018) – do check them out on our Press page. We have two departures in 2019, in early June and mid September – do go to our website to read the full details on what you can expect on this fantastic trip. Our Classic Cols format gives you optimum flexibilty, so you really can decide on a daily basis how much you want to push yourself. These holidays are fantastic for groups or couples of mixed ability – this is your holiday after all, so you get to decide how much (or little) cycling you want to do, without feeling under pressure to keep up with someone else’s pace, or on the flip side, hanging around at the top of a col waiting for the rest of the group. Do drop us a line if you’d like to discuss which dates are best for you. We’ve now finalised all our transfer times that link with direct flights from UK airports, up until the end of August. This means you can now confidently go ahead and book flights for your 2019 holiday with us. Booking your flights now will obviously get you the best deal. Once booked, please let us know your flight times by logging in to the Link so we can arrange your transfer. As soon as all the major airlines have released their timetables for September and October, we’ll let you know our transfer times for those months. Please hold off booking flights for those later trips until then. 1st Catalonia Tour Deemed a Great Success! During our final night’s meal overlooking the Mediterranean sea in the lively town of Tossa Del Mar, the conversation naturally turned to reviewing our 6 days of cycling. Smooth roads, no traffic, great scenery, perfect weather, challenging optional climbs, the smell of pigs(! ), wonderful routes, spending time in Girona, quality hotels and great food were all mentioned. With the combination of all of this (pigs aside), it’s easy to see why Girona has become a mecca for pro and wannabe pro cyclists. Our journey around Catalonia took us off the beaten track to ski stations, isolated hamlets, coastal towns and historic cites on a manageable and well graded ‘classic’ route. Those in the group wanting more of a challenge were not disappointed with some long days and a few ‘cheeky’ climbs with gradients often over 15%. Phew! In summary, Catalonia is the perfect place for a Spring or Autumn road cycling holiday. It easily rivals Majorca in terms of cycling quality and climate, but has the added advantage of not being overrun by cycling groups. We have 5 trips scheduled for 2019 and they’re already half full, so if you want to experience this region for yourself, please get in touch and book soon! As ever, our incredible guides have been behind you every step of the way, whether it be in their support vehicle at the top of a col with a thirst quenching slice of melon and handful of M&Ms, or on hand with a spare wheel just when you needed it. We’re exceptionally proud of our guiding team but this year they really have pulled out all the stops and worked fantastically as teams, with passion and seemingly endless reserves of energy. Each member of the team has their own particular strengths but without exception, they all bring their professionalism, experience and sense of humour so that whatever challenges they might have faced on a trip, you, our clients, have had the best possible holiday experience. Thank-you doesn’t even begin to cover it but we shout it loudly to them all, nevertheless! Our guides now have some well deserved time for their own adventures before our winter season starts with Gran Canaria in January and Tenerife in February – here we go again! Meanwhile, back at Marmot HQ, there’s no downtime for the equally hard working office team of Sabine, Catherine, Kate, Graham and (ahem) Sophie in Marketing, who are all entering our busiest booking season ever as you get planning your next adventure for 2019. They have managed everything behind the scenes during what has been an incredibly busy year, pedalling away furiously but always with a focus on you and a smile, so a massive thank-you to them too! This month we’ve posted a guest blog from loyal client Monica Guy, who has focused on women’s cycling. If you’ve got a talent for writing and would like to offer us any content, do get in touch. We can’t promise to publish what you send us but we’ll happily take a look.